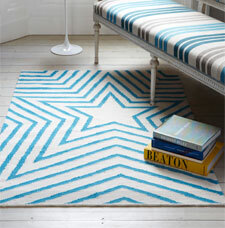 Freddie is a collection of flat-woven wool rugs featuring a concentric stars design in various colours. The rugs are as thin and heavy as traditional kilims but with a contemporary design. Freddie rugs are an excellent range of contemporary flatweaves, which are suitable for any modern room setting.